The core of ReadyDesk is the ticketing system. 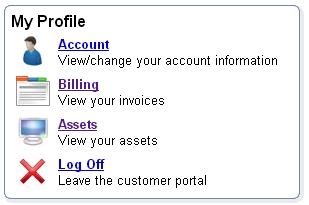 Tickets can be created by customers and technicians from the web interface and from incoming emails. All updates are tracked in the ticket history for a full audit trail, and file attachments are handled with ease. The ticket interface allows technicians to customize the view by adding and removing columns, resizing them and sorting them with the click of a button. Click Here for more information. With ReadyDesk you can create an unlimited number of unique customer portals based on domain and sub-domain names. You can have one portal for http://sales.yourdomain.com and a completely different one for http://support.yourdomain.com, each with their own layout, logos and features. Have multiple products or websites to support? Just create more portals and support all of your customers with a single installation of ReadyDesk. The live chat feature allows customers to chat with your technicians in real time. When a customer connects you can view their complete account information, their IP Address, their domain name, what browser they are using and how many open tickets they have. Technicians can setup their own personalized automated greetings and canned responses for quickly inserting answers to commonly asked questions. Both the customer and technician can see typing notifications so they know that the other party is still there and actively responding. Using the optional translation feature, customers and technicians can chat with each other on their native languages, and ReadyDesk will translate the text automatically. There is nothing to install, and it works in all major browsers including Internet Explorer, Firefox, Safari, Opera and more. Click Here for more information. Track web site traffic on any web page. View details about who is on your site including IP addresses, the web browsers they are using, what keywords they used to find your web site and even their geographic locations. The traffic data is displayed in real-time so there is no need to refresh the page. 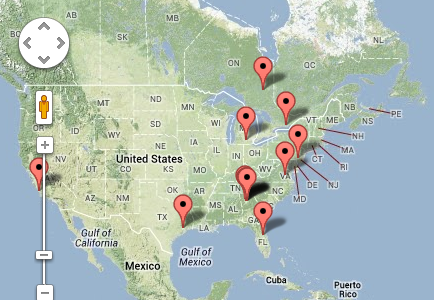 There is even a map view so you can quickly see where your visitors are coming from. 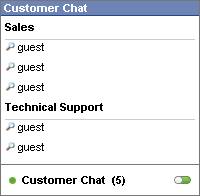 Technicians can send chat invitations to your visitors manually, or you can create workflow rules to prompt visitors to start a chat session based on criteria like what page they are on, how long they have been on a page and by geographic location. Click Here for more information. ReadyDesk has completely integrated Remote Desktop support. This feature will allow you to instantly connect to your customers' Windows-based computers to view and control their desktop in real time. The Remote Desktop feature works through firewalls and proxies. Customers do not have to install anything on their computer. They just have to run a small executable that connects them to the IP address you specify. Technicians then simply click on a hyperlink and the viewer is launched. 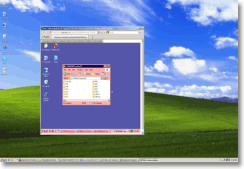 All remote desktop sessions are securely encrypted. Click Here for more information. These are just a few of the many features of ReadyDesk. Use the links at the top of this page to explore more features.